For information about the active ingredient in Tylenol, see paracetamol, also known as acetaminophen. Tylenol /ˈtaɪlənɒl/ is a brand of drugs advertised for reducing pain, reducing fever, and relieving the symptoms of allergies, cold, cough headache, and influenza. The active ingredient of its original flagship product is acetaminophen (known in most Commonwealth nations as paracetamol), an analgesic and antipyretic. Like the words acetaminophen and paracetamol, the brand name Tylenol is derived from a chemical name for the compound, N-aceTYL-para-aminophENOL (APAP). The brand name is owned by McNeil Consumer Healthcare, a subsidiary of Johnson & Johnson. As of 2017, the "Tylenol" brand was used in Brazil, Canada, China, Egypt, Lebanon, Myanmar, Oman, the Philippines, Portugal, South Korea, Spain, Switzerland, Thailand, the United States, and Vietnam. The active ingredient in Tylenol is paracetamol, also known as acetaminophen, a widely used over-the-counter analgesic (pain reliever) and antipyretic (fever reducer). Formulations with additional active ingredients intended to target specific applications are sold under the Tylenol brand. These can include codeine as co-codamol, dextromethorphan, methocarbamol, guaifenesin, pseudoephedrine, caffeine, diphenhydramine, chlorpheniramine and phenylephrine. The brand was introduced in 1955 by McNeil Laboratories, a family owned pharmaceutical manufacturer. Two brothers took over the company from their father that year, and that year one of them learned about paracetamol, which was not on the US market at that time. To avoid competing with aspirin, they marketed it as a product to reduce fever in children, packaging it like a red fire truck with the slogan, "for little hotheads". 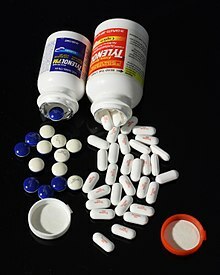 The name "Tylenol" and the generic name "acetaminophen" were generated by McNeil from the chemical name of the drug. Johnson & Johnson bought McNeil in 1959, and one year later the drug was made available over the counter. On September 29, 1982, a "Tylenol scare" began when the first of seven individuals died in the Chicago metropolitan area after ingesting Extra Strength Tylenol that had been deliberately contaminated with cyanide. Within a week, the company pulled 31 million bottles of tablets back from retailers, making it one of the first major product recalls in American history. As a result of the crisis, all Tylenol capsules were discontinued, as were capsules of other brand names. Retained by McNeil's president, Joseph Chiesa, new product consultant Martin Calle of management strategist Calle & Company conceived the world's first tamper-resistant gelatin-enrobed capsule called "Tylenol Gelcaps", which proved to resuscitate the 92% of capsule-segment sales lost to the recall. The tamper-resistant, triple-sealed safety containers were placed on the shelves of retailers 10 weeks after the withdrawal, and other manufacturers followed suit. The crisis cost the company more than $100 million, but Tylenol regained 100% of the market share it had before the crisis. The Tylenol murderer was never found, and a $100,000 reward offered by Johnson & Johnson remains unclaimed. Before the poisonings, Tylenol brands held around 35% of the US market for acetaminophen and in the immediate aftermath, fell to 8%. Within a year sales had rebounded to the prior levels. J&J's handling of the crisis has been widely cited as an example of optimal crisis management. These events led to the widespread use of tamper resistance packaging of drugs by drug companies, to the 1982 passage of a US federal law making tampering a crime, and to legislation in 1989 requiring tamper-proof packaging. On January 15, 2010, Johnson & Johnson announced a voluntary recall of several hundred batches of popular medicines, including Benadryl, Motrin, Rolaids, Simply Sleep, St. Joseph Aspirin and Tylenol. The recall was due to complaints of a musty smell suspected to be due to contamination of the packaging with the chemical 2,4,6-tribromoanisole. The full health effects of 2,4,6-tribromoanisole are not known but no serious events have been documented in medical literature. The recall came 20 months after McNeil first began receiving and investigating consumer complaints about moldy-smelling bottles of Tylenol Arthritis Relief caplets, according to the United States Food and Drug Administration (FDA). The recall included 53 million bottles of over-the-counter products including Tylenol, Motrin and Rolaids, Benadryl and St. Joseph's Aspirin, involving lots in the Americas, the United Arab Emirates and Fiji. On April 30, 2010, another recall was issued for 40 products including liquid infant and children's pain relievers, Tylenol, and Motrin and allergy medications Zyrtec and Benadryl. An FDA report said its inspectors found thick dust and grime covering certain equipment, a hole in the ceiling, and duct tape-covered pipes at the Fort Washington, Pennsylvania, facility that made 40 products recalled. New testing regulations were enacted after the recall to ensure product quality and safety. On May 5, 2010, the FDA confirmed that the bacterium found at the Johnson & Johnson plant that made the recalled Children's Tylenol was Burkholderia cepacia, a bacterium often resistant to common antibiotics. The bacteria were found on the outside of certain product-containing drums, but not in the finished product. The CDC has stated that Burkholderia cepacia is not likely to cause health problems for those with healthy immune systems, but those with weaker ones and those with chronic lung diseases, such as cystic fibrosis, could be more susceptible to infection. Tylenol has many different advertisement approaches. One of these advertisement campaigns focuses on "getting you back to normal", whereas the other commercials focus on Tylenol's current slogan, "Feel better, Tylenol". In the "Feel better, Tylenol" commercials, Tylenol places emphasis on the importance of sleep; various people are seen sleeping in this commercial while a voiceover describes how sleep can help repair and heal the human body during times of aches and pains. In the "getting you back to normal" commercial, Tylenol places more emphasis on helping its consumers get back to their daily routines; many different people are shown first experiencing headaches and other sorts of body pain, where a voiceover then states that Tylenol Rapid Release can help rid aches and pains; the various people are then shown enjoying their everyday lives, and are seen as "back to normal". In an older commercial from 1986, Tylenol emphasized that it is the drug that American hospitals trust the most. In this ad, Susan Sullivan told the consumer that Tylenol was a drug that could be trusted by Americans since many doctors also trusted it; she went on to state that doctors prescribed Tylenol four times more often than other leading pain relieving drugs combined. A form that contains dextromethorphan, pseudoephedrine, acetaminophen, and chlorpheniramine, is sold as Cotylenol. As of 2017, the "Tylenol" brand was used in Brazil, Canada, China, Egypt, Lebanon, Myanmar, Oman, Philippines, Portugal, South Korea, Switzerland, Thailand, United States, and Vietnam. ^ West, Nancy. "History of TYLENOL" (PDF). Nancy West Communications. Retrieved July 26, 2014. ^ Euromonitor International. "Acetaminophen benefits from concerns surrounding safety of analgesics". Market Research World. Retrieved July 26, 2014. ^ a b "Paracetamol international brands". Drugs.com. Retrieved 4 March 2017. ^ Aghababian, Richard V. (22 October 2010). Essentials of Emergency Medicine. Jones & Bartlett Publishers. p. 814. ISBN 978-1-4496-1846-9. ^ Ahmad, Jawad (17 October 2010). Hepatology and Transplant Hepatology: A Case Based Approach. Springer. p. 194. ISBN 978-1-4419-7085-5. ^ "Pain Relief Products for Adults & Children". Tylenol. Retrieved 11 August 2017. ^ Miller, Stephen (26 May 2010). "Creator of Tylenol 'For Little Hotheads'". Wall Street Journal. ^ New York Times article: "Tylenol made a hero of Johnson & Johnson : The recall that started them all." ^ a b Markel, Howard (September 29, 2014). "How the Tylenol murders of 1982 changed the way we consume medication". PBS NewsHour. ^ Dezenhall, E. (2004-03-17). "Tylenol Can't Cure All Crisis". Retrieved 2007-10-08. ^ Tylenol recall expands, WebMD, accessed 1-17-2010. ^ "Media Center Main - Johnson & Johnson". Retrieved 10 December 2016. ^ a b Reuters Editorial (4 May 2010). "FACTBOX-Johnson & Johnson's recent product recalls". Reuters. ^ Reuters Editorial (May 4, 2010). "FDA finds grime at J&J plant, urges use of generics". Reuters. ^ Kavilanz, Parija (6 May 2010). "Bacteria identified in Tylenol recall". CNN. Retrieved 21 July 2010. ^ Midori's Tylenol Commercial. 23 August 2009 – via YouTube. ^ Tylenol Rapid Release - Suzumiya Haruhi. 12 September 2008 – via YouTube. ^ Tylenol Commercial (1986). 19 August 2007 – via YouTube. ^ "Co-Tylenol Drug Information, Indications & Other Medicaments on Catalog.md". Retrieved 10 December 2016. ^ "CoTylenol oral : Uses, Side Effects, Interactions, Pictures, Warnings & Dosing - WebMD". Retrieved 10 December 2016. Wikimedia Commons has media related to Tylenol. This page was last edited on 1 March 2019, at 03:19 (UTC).